← Spiritual Spectra hosts a Women’s Wellness Retreat at a beautiful lakeside resort! Are you just getting started in business? Has your existing business stagnated? Are you ready to retire your business? Regardless of the stage your business is in, Spiritual Spectra can offer your business the guidance it needs. Our Spiritual Consultations can provide the following help to your business. Business start-ups: Starting a business is exciting but it can also be scary and overwhelming. Spiritual Spectra provides resource information and guidance as to how to get a business started and how to begin to market the business. Existing Businesses: Sometimes a business owner can be too close to an issue or challenge to see clearly what is at the root cause of it. It is only when you know the root cause that you can address it appropriately. Spiritual Spectra offers Consultations for businesses offering guidance on the direction to take for their business, helping them understand their business’ strengths and weaknesses and how to improve upon them, how to better market their business, and recommendations on how to take their business to the next level. Businesses looking to sell/retire: Spiritual Spectra offers guidance on how best to position the business to get it ready for sale or pass it on to the next generation. Jennifer Garcia, the Founder of Spiritual Spectra, has the talent, skills and experience to help your business. Prior to founding Spiritual Spectra, Jennifer ran her own marketing and design business called Logicreative for seven years. She utilized her creativity, writing, problem solving, web and graphic design skills helping small business owners market their businesses. Let Jennifer put her intuition and experience to work for you! Spiritual Consultations are offered at our office in Columbia, Maryland. To schedule an appointment or to learn more, contact us at 1-888-934-3642 or info@SpiritualSpectra.com. All businesses need to set and meet goals. Spiritual Spectra offers Goal Setting Consultations which helps business owners create a vision statement and goals for their business. Clients will come away with a vision statement and a concrete plan of action which will list actions needed to be taken, challenges needed to be overcome and a timeline by which to achieve their vision. Goal Setting Consultations are offered at our office in Columbia, Maryland. To schedule an appointment or to learn more, contact us at 1-888-934-3642 or info@SpiritualSpectra.com. become emotionally healthy and well-balanced. As a result, this can minimize absenteeism, staff turnover, and stress-related expenses. For businesses with 3 or more employees, we can travel onsite to your business location or staff retreats to offer services to your staff. 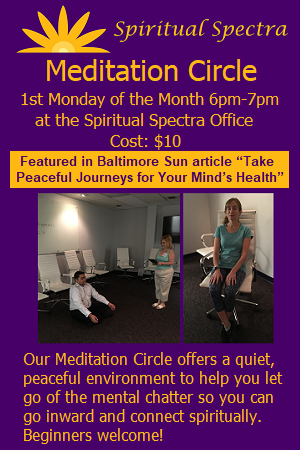 To schedule an appointment/session or to learn more, contact us at 1-888-934-3642 or info@SpiritualSpectra.com. This entry was posted in Corporate Wellness, Energy Healing, Our Musings, Property Energy Clearing, Spiritual Consultation. Bookmark the permalink.